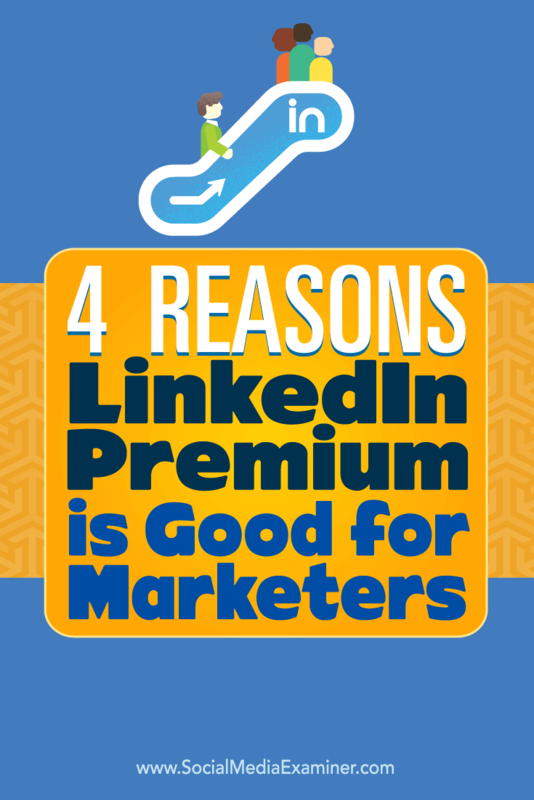 In this article, you’ll discover four ways LinkedIn Premium can help you improve your marketing. 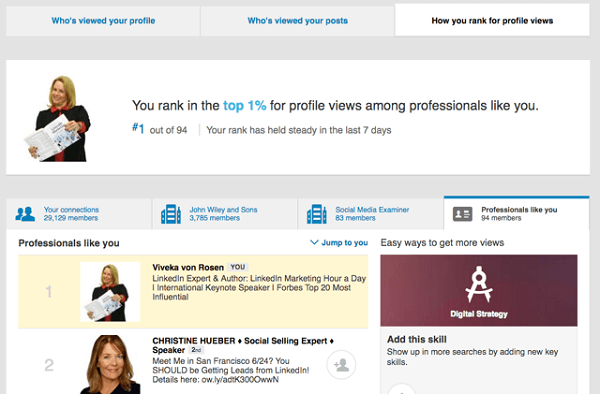 Discover four ways you can use LinkedIn Premium to improve your marketing. LinkedIn was developed specifically for growing your business and building relationships. Marketers and business owners spend money on their businesses each month; whether it’s a CRM tool (like Salesforce or Nimble), a business consultant or virtual assistant, or a tech person or service to manage their website. 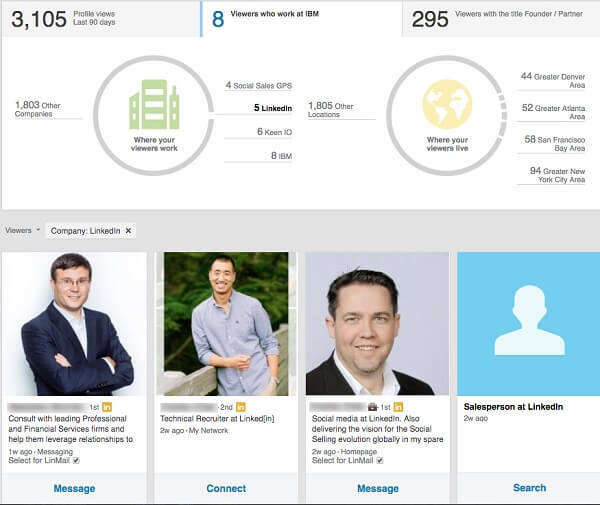 LinkedIn Premium is an investment, just like any other business tool. 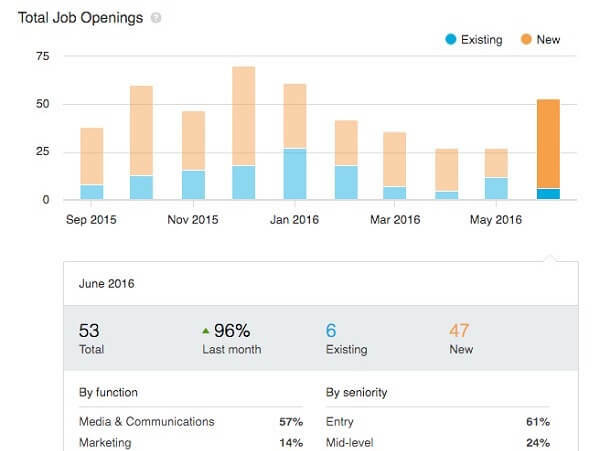 Here’s how LinkedIn Premium can help your business. While a free LinkedIn account shows you only the last five people who viewed your profile, a Premium account shows everyone. If more than five people a day view your profile, it’s worth investing in Premium. With a free account, if you decide to be anonymous, you lose the ability to see who’s viewed your profile. With a Premium account, you can remain anonymous and still see who has viewed your profile. A Premium account allows you to see more of the people who have viewed your account. You also have more sorting tools with a Premium account. That way you can see if people from a specific company, industry, or with a specific title have viewed your profile. The people who view your profile are usually clients, prospects, colleagues, classmates, or competitors. An additional level of detail allows you to better engage with people and be more specific in your responses and messaging. Plus, you can see which competitors look at you and find out what they’re doing. After you see which members have viewed your profile, it’s easy to take a look at their profiles and connect with them. From Who’s Viewed Your Profile, it’s easy to send a message to your first-level connections or invite new people to connect. Click on their name, and invite them to connect from their profile. This does two things: It allows you to view their profile and customize the invite. 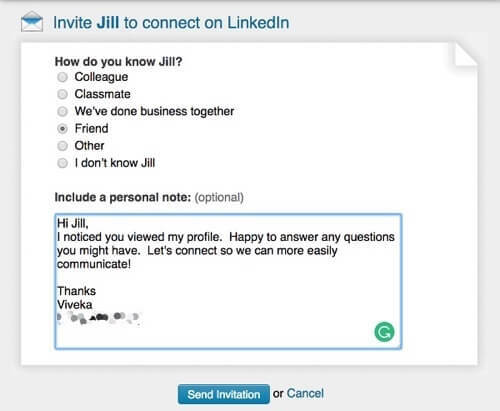 If you just click Connect from Who’s Viewed Your Profile, LinkedIn will send out a default invitation. Always customize your connection requests. Even though they’re harder to see on desktop, they pop right up in the mobile app. Because more than 50% of LinkedIn members use the mobile app over the browser, it makes sense to customize your invites. When sending the connection request, choose Friend as your option for how you know someone, since people can no longer see how you know them. Choose Friend, and always customize your invitations. The designations in Who’s Viewed Your Profile (such as company name, where they live, and their titles and industries) will help you see whether your profile is attracting the right people. If the people who view your profile live in another country, are in an unrelated industry, and are nowhere near your target client, you’re probably not connecting and engaging with the right people. This is a red flag to update your profile, engage more with the right people, and post more relevant content. 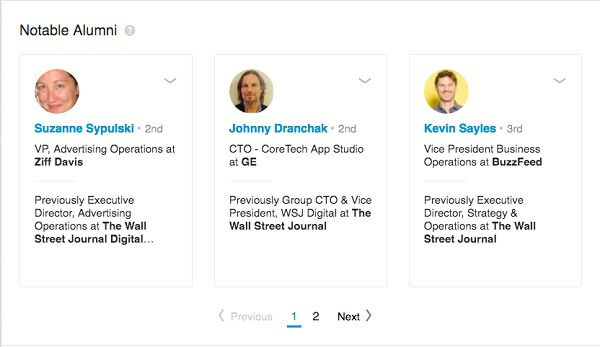 To find your ranking on LinkedIn, click on the same link to see who viewed your profile. This will show you how you rank within your connections and your company. With Premium, you also see where you rank in comparison to other professionals like you. View your ranking to see how your profile does in comparison to others in your industry. Your LinkedIn ranking only has to do with who viewed your profile; it has no bearing on who you are as a person or in your business. There are two advanced search features that come with a Premium account: premium search fields and more saved searches. While you can get decent results using the advanced search with the free account, the premium search fields let you further refine your search, so you get the exact prospects you want. Options include Groups, Years of Experience, Function, Seniority Level, Interested In, Company Size, and When Joined. There are many more options for search customization with a Premium account. 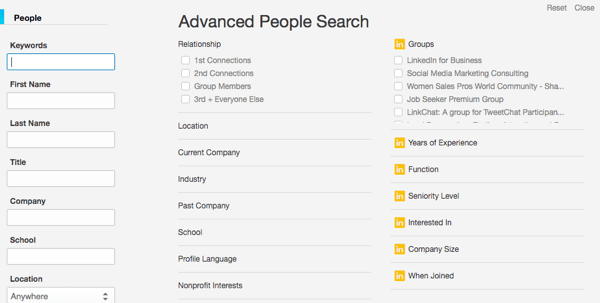 Groups: Use Groups to refine your search, because you can better engage with people who are in your groups. You can either comment on their group discussions or send them a private message. Note that even with advanced search, you can only send a total of 15 private messages to other group members (who are not already connections) each month. Seniority Level: To find the decision-makers at companies you’re targeting, use Seniority Level. This lets you bypass the gateway people, and go directly to the top. Company Size: Looking to do enterprise engagement? Sort by larger companies. Want to connect with smaller companies for client work? Look for them. Saved searches are extremely helpful and an under-utilized tool. You don’t need to recreate common searches. Just save them. With a free account, you get three saved searches; with a Premium account, you get seven saved searches. Plus, with a Premium account you get more search results. Save time by saving your frequent searches. For each saved search, you’ll receive automatic alerts whenever new people fall into those particular criteria. LinkedIn is literally emailing you leads, whom you can then invite to connect. If you’re already connected, send them a message. To both review and save your Premium searches, click on the Saved Searches link in the top right. Then customize your saved search with a title that makes sense to you. You can also go there to see your new weekly connections. With a free LinkedIn account, you get to see companies you might be interested in working with and see people you know who work there through Insights. Simply click on How You’re Connected. As above, you can invite second-levels to connect (or get an intro) and send messages. You’re also able to see and engage with the company’s recent updates. Basic insights are available with a regular account, but learn more about a company through Premium. 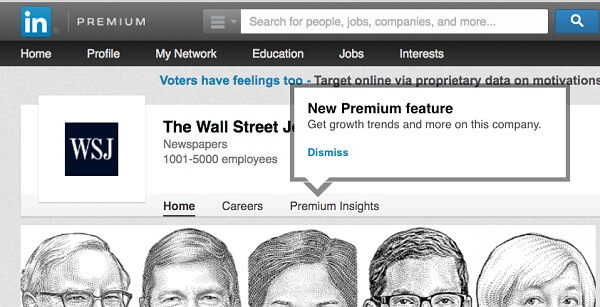 With a Premium account, you can access the new Exclusive Premium Insights. Note: LinkedIn calculates their insights based on information provided by LinkedIn members. For a number of reasons, they may vary slightly from actual company information. Employee Count: The Employee Count is not new, but you can see the growth and decline of a company’s employees, as well as the average tenure at that company. This information signifies stability or lack thereof. Review Employee Count to check a company’s stability. Employee Distribution: To view Employee Distribution by function, choose four functions that interest you, from Administration to Sales. 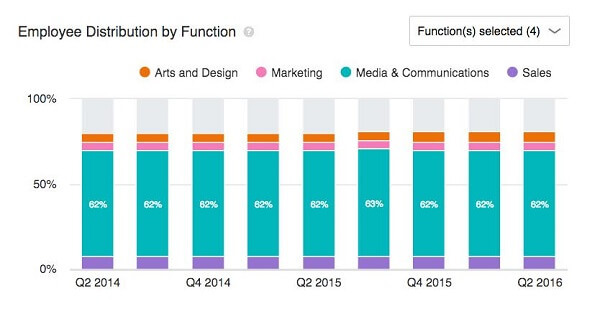 Also, see quarterly fluctuation in employee function. Take this information and determine in what functions the company is growing and shrinking, and see if there’s opportunity for you. Take a look at Employee Distribution by function. Notable Alumni: Also look at Notable Alumni. Use this information to determine if there’s an influencer you know whom you can engage with or connect with through another person. Find notable alumni from your alma mater and connect with them. Total Job Openings: This is segmented by both existing and new job openings. These job openings are also sorted by function and seniority. If you’re a professional looking for employment, these insights can be invaluable. See what job openings are available at a place you might want to work. Knowing more about a company is an advantage when seeking opportunities, engaging with employees, and more. Premium members have the ability to opt for Open Profile. This will allow other members who are not first-level connections to easily send you private messages. You also get InMail, which allows you to send messages to people with whom you’re not connected. You get up to 25 InMail credits a month. If you send a message that gets a reply, you get that message credit back. This messaging allows you to engage privately and seamlessly with prospects, clients, and others. LinkedIn is first and foremost a business tool, and a social platform secondly. 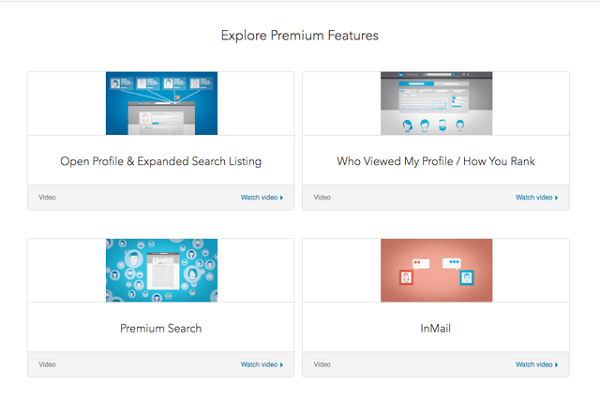 There is a ton of value in LinkedIn Premium accounts. The features help you communicate and engage with current and potential connections in a seamless manner. Plus, Premium does wonders to help you convert prospects to clients. What do you think? Do you have a Premium LinkedIn account? How do you use it? Please share your thoughts in the comments. 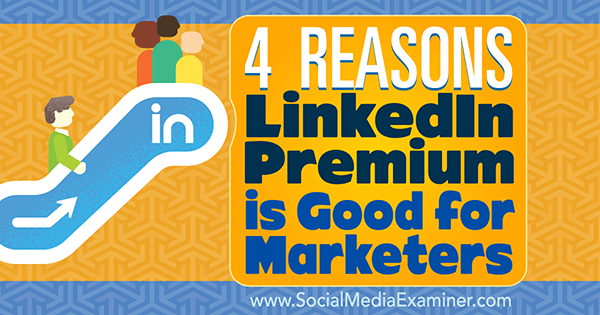 Tips on four ways you can improve your marketing with LinkedIn Premium.